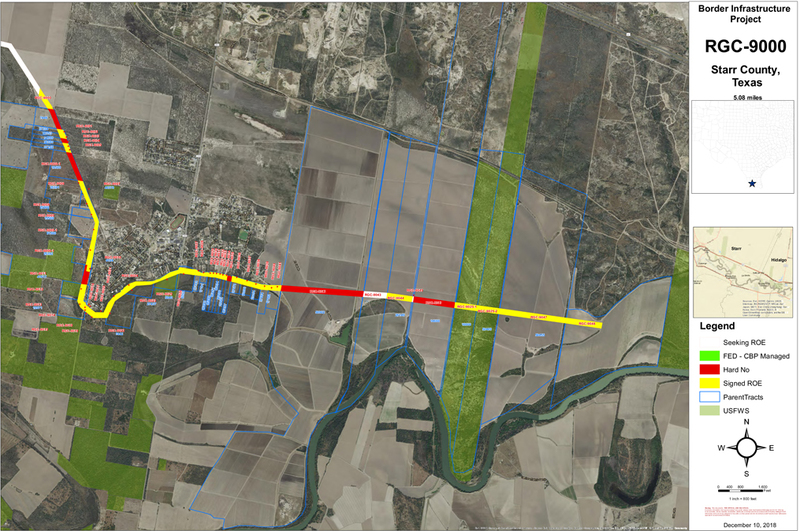 Newly obtained documents and maps appear to indicate when and where the government is expected to build about 8 miles of border wall approved for Starr County in March 2018. The maps show several areas in Starr County along the U.S.-Mexico border along the Rio Grande; with yellow marks indicating where the government has already been granted right of entry, white showing where the government is still seeking right of entry permission, and red highlighting where the government has not been granted permission to build or survey. Dated Dec. 10, 2018, the maps are the first real detailed images showing Starr County residents which areas would be impacted by border wall construction of bollard fencing reaching 18 feet high. The project in Starr County is being led by Omaha, Nebraska-based Kiewit, a construction and engineering company, documents show. 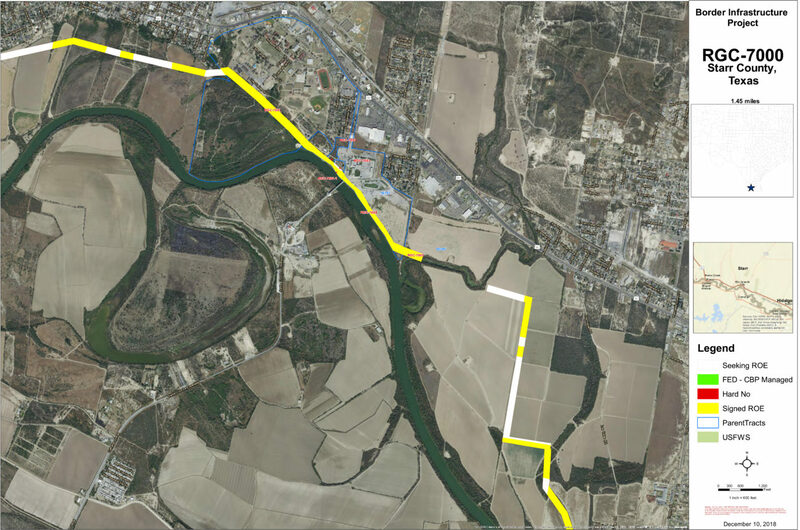 In order to complete the project, documents further show that Kiewit is soliciting bids from subcontractors for construction of 18-feet tall border fencing with access and patrol roads in three separate cities — Roma, Rio Grande City, and La Grulla. 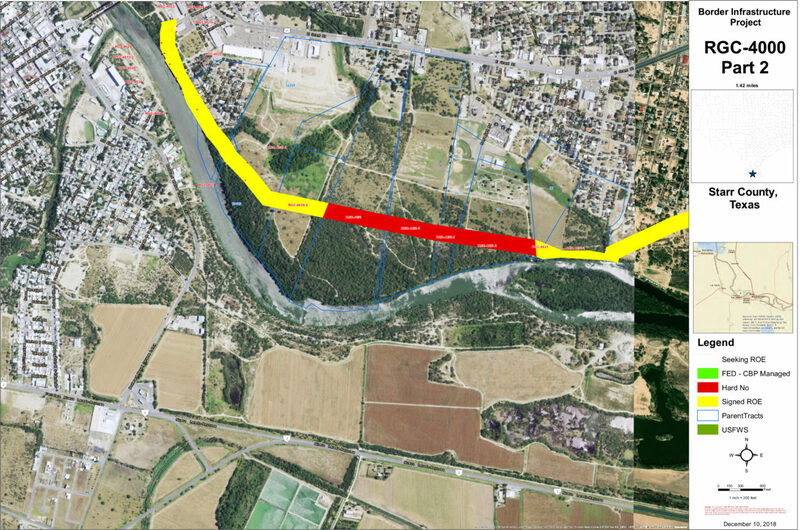 A notice to proceed is slated for May 10 with construction expected to begin Sept. 1, the construction company’s website states. 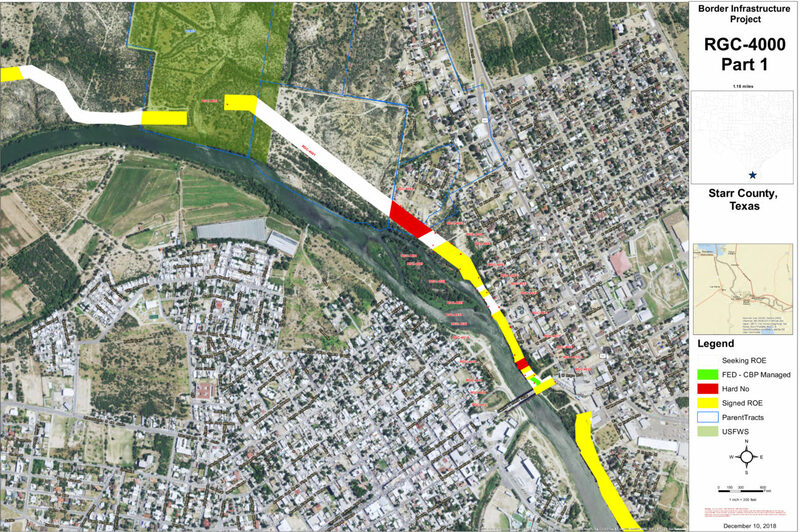 During the summer of 2017 and in the subsequent months, U.S. Border Patrol and Customs and Border Protection officials began meeting with city leaders in Starr County to discuss the proposed plans for border wall fencing in the county, stating that they would avoid disrupting historical areas and specific downtown plazas situated near the river. 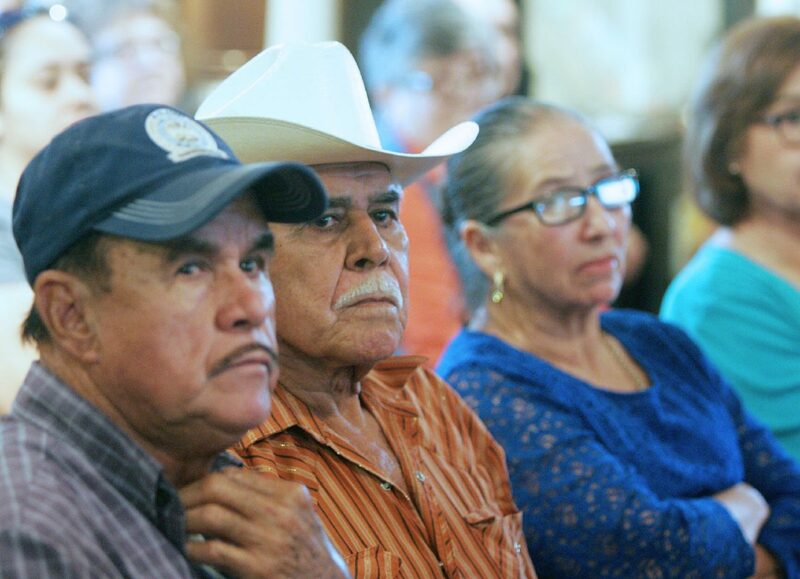 Concerned about their own properties along the river, and due to a lack of communication with Border Patrol and CBP officials, landowners and other interested parties convened for a meeting in Roma in late October 2017 to learn more about the proposed construction. 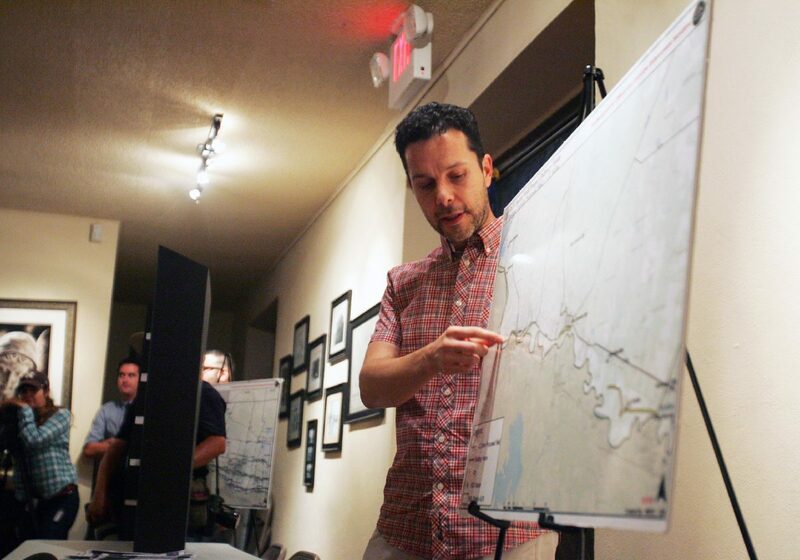 That meeting, hosted by environmentalists and lawyers who were experts in eminent domain and litigation with the federal government, was the first public meeting that included the very residents who were to be impacted by the proposed construction. No government officials attended. And though lawyers presented landowners with some legal advice as to how to deal with government contractors who would be requesting permission to survey their property, the maps available at the time did little to provide an accurate depiction of where the construction would take place. This left many property owners with more questions than answers. At the time, many questioned why CBP officials had not attended the meeting. The premise of border wall construction in the Rio Grande Valley became a reality after Congress approved a $1.3 trillion omnibus bill that allocated funds for 25 miles of border wall fencing in Hidalgo County, and 8 miles of wall in Starr County. Earlier this week, both the Rio Grande City school board and the city commission approved right-of-entry requests from CBP officials. 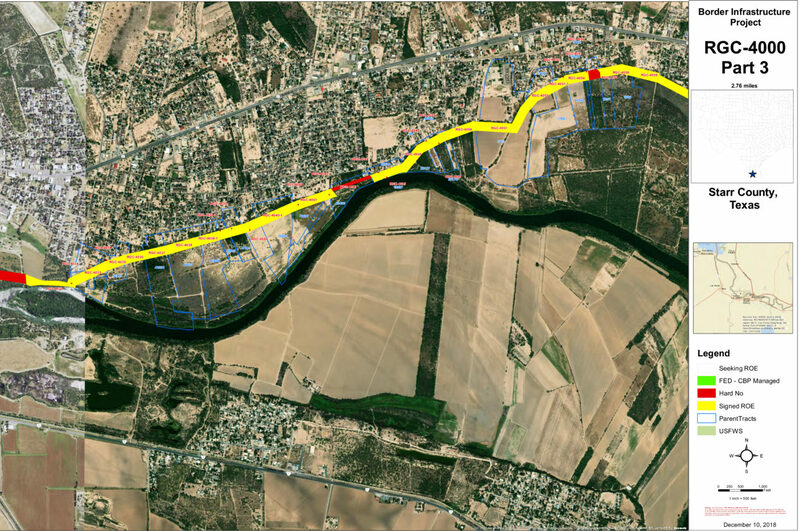 The city commission did so unanimously, with city commissioner Dave “Chachi” Jones absent from the meeting, though Mayor Joel Villarreal said he’d, at one point, like to see where exactly the wall would be placed and to consider the gates, access and impact in the area. The school board, on the other hand, was splintered with four of the seven board members voting to approve the request for purposes of survey and site assessment. School board president Eduardo “Eddie” Ramirez joined members Basilio “Bacho” Villarreal, Noe Castillo, and Leticia Lopez in voting to approve the request after the school district’s attorney noted a denial would likely land them in federal court, racking up legal expenses. At the Bentsen federal courthouse in McAllen, several federal civil lawsuits related to the government’s attempt to seize lands from private owners are currently being heard — this despite a partial government shutdown limiting other civil cases from being heard in the Southern District of Texas courts. Of the several cases currently being litigated in court, one involves land owned by a religious school in Pharr, the Pharr Oratory of St. Philips Neri School, and another involving a Hidalgo man, who stands to lose about 5 acres of land if the courts rule in favor of the federal government, court records show. The civil cases will be heard despite the shutdown as land seizure cases are seen as a priority, amid negotiations between lawmakers and the president continue over border security, specifically funding for a physical wall along the U.S.-Mexico border. A government jobs website shows an opening for two attorneys to work “in support of border wall civil litigation” in McAllen and Brownsville — further indication that the land cases are a priority. The positions, which would pay the attorneys a salary between $53,062 to $138,790 per year, are not to exceed 14 months, but could “be extended or made permanent without further competition,” the website states.